Slack is a popular collaboration tool that is becoming a natural choice for small to medium sized teams. It has a clean, intuitive interface that neatly organizes your conversations in the forms of chat rooms and associated options. Plus, it offers a Free and two reasonable paid plans, which makes it a no-brainer for most teams. Primary replacing the use of emails to escape lengthy Email conversations, Slack helps teams discuss (and in some cases create) tasks and projects, make voice and video calls, create groups and add attendees as required. It also lets teams search through message history with a powerful search option. With all these features, it definitely offers teams the ease of collaboration and is thus rated highly as one of the best productivity apps in the market effective team management. To give an idea of what it entails, it includes comprehensive modules related to tasks, projects, meetings, timesheets, issue, risk tracking as well as powerful search and filter options. Task management including to-do lists, task creation, assignment, organization, prioritization and sharing tasks with multiple statuses. Project management options including reports, timelines, Gantt charts, percent completion, the option to interchange tasks. You can create projects and assign tasks or treat tasks independently. Looking for the perfect Slack Project Management assistant? See for yourself why Slack users are adopting nTask for Slack Project Management. 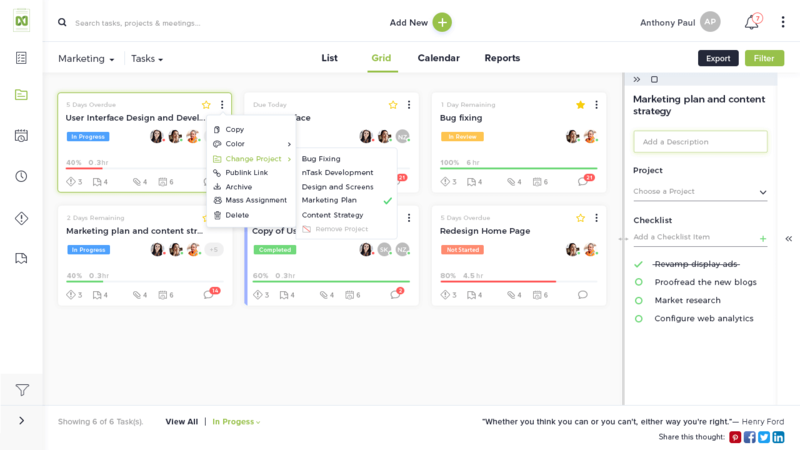 Create unlimited, tasks, meetings & more. Being trusted by leading teams such as Nokia, Audi, Samsung and more, this tool seems to be going places with its recent announcements of partnerships with Amazon and Gluu. You add multiple types of details to conversations including links, meeting notes, upload files and pin important messages to highlight them for the chat attendees. Plus, it reduces guesswork by offering chat statuses including messages seen, last active or simply a team member writing a reply. Add images, files and other information to clarify discussions. The best part is, unlike Slack that gives a search option for a limited number of messages in the past (on the Free plan), Twist helps you find information through hundreds of conversations from years ago. Talking about keeping up with progress, Twist actually surveyed their users for potential improvement in their collaboration. Amid other percentages relevant to calmness, focus, and synchronization, 81% agreed to be more efficient. This Slack alternative for project management has clients including food franchises, publishing house, churches and more. 96% of their users have agreed to Glip simplifying their communication. Glip offers team chats and messaging for remote and local teams, file and information sharing, and task/project management options. Also, the unlimited storage option makes it all the more worthwhile for documents, spreadsheets, presentation files, contracts, invoices, images, and videos.